Just like the rest of the world, I’ve caught the ‘tidying’ and organizing bug this year! To call it a ‘bug’ makes it sound bad, but on the contrary - its a very, very good thing (for me, my sanity and the happiness of my family unit). ha! Having a clean, organized and visually appealing space is so refreshing! You can breath, focus and actually stay on task and speaking from someone who works from home - it really does work! I’m on an organizing and de-cluttering journey this year, but my strategy is to start small and tackle projects around my home bit by bit as I have a tendency to get overwhelmed easily! First up - the kitchen! The place that gets the most traffic and mess in all the land! But i’m breaking things down drawer by drawer and cabinet by cabinet instead of the whole she-bang. Today, we are tackling the spice cabinet! This is actually just common sense, but you have to start somewhere! I took all the things out of the cabinet, vacuumed the shelves and wiped everything down. Then I took inventory of what we actually used, consolidated and tossed the rest. We had duplicates of several things like salt and baking powder and lots of outdated items stuck in the back. I realize it may seem silly to dump your perfectly good bottle of McCormicks cumin into a plain glass container, but it really does help to simply and de-clutter! I found this very affordable set (I bought 2) on Amazon and I am super happy with the quality and style! ha! But seriously, in addition to my Dyson this lil’ label maker is my new favorite thing! I love the timeless simplicity of the black and white letters and the labels are super durable and stick to the glass nicely! 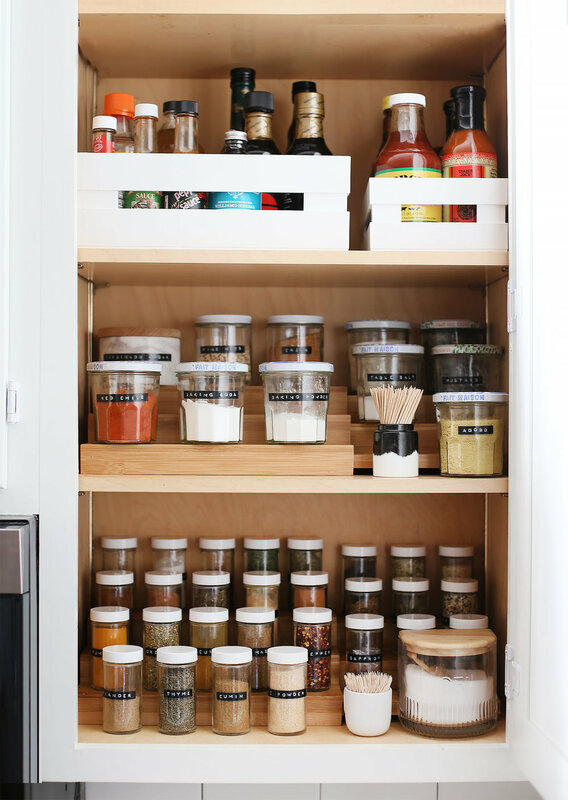 I found these really great bamboo expanding spice shelves at The Container Store (that place is like crack to me) and I love how they make use of both the vertical and horizontal cabinet space. I organized by how often I used the spice (the ones on the front row are the most used) and grouped by size and section (for example: I needed a bigger container for baking soda and so on). I did think to try and remove all of the brand labels off of the bottles of vinegar and hot sauce and replace with my labeling system, but that just seemed way too time consuming and tedious! Instead I found these really cute stackable storage bins and put all the left over bottles of various sauces, vinegars and so on into those and stacked them on the top shelf. I can easily access them with my step stool as needed and they are all neatly organized together! I can’t tell you how much happiness this brings me as well as the drive to keep going in other areas of my home! I can relax and thrive in a tidy home and my goal is to not only organize but maintain! This post does contain some affiliate links meaning if you purchase something you've clicked on, I will get a small commission. I only promote the products I truly love!